Trevor -- With Dazzler's return to the pages of the X-Men will we be seeing the story of her lost child and Longshot's fate? 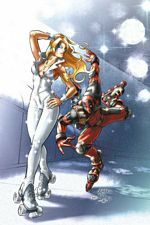 Marts, Michael -- Dazzler will indeed be making a return to the X-books in late 2005, but don’t expect us to get right into the story concerning her and Longshot’s “child’. We’ll be spending a lot of time with Alison Blaire, though, so don’t worry. In fact, she’s the first character we’ll see on page 1 of the new—whoops, almost let the proverbial cat out of the bag again. In any event, stay tuned. Trevor -- When you think of the villains that the X-Men have faced, which character would you put as their second greatest villain and why? Marts, Michael -- Well, assuming we’re designating Magneto with the #1 spot, then I’ll have to choose Apocalypse as the second greatest X-villain, with Sinister pulling in as a close third. Besides Magneto, I can’t think of one villain who has touched the X-Men—heck, the entire X-Universe—more than En Sabah Nur (that’s Apocalypse to those in the know). Think of all the characters he’s directly affected—from Cyclops to Wolverine to Cable to Archangel to Sinister…the list goes on. Then add to that everything he’s indirectly been involved in…Age of Apocalypse, The Twelve…this guy has his mark on every X event from the beginning of history to the end of time in some form or another! Too bad he’s dead, right? Trevor -- There have been plenty of stories about the X-Men that were never told due to editorial decisions. Can you tell us about a storyline that you might have been forced to nix and why you nixed it? Marts, Michael -- One particular story that never saw the light of day was a full-fledged romance between Storm and Cable. We hinted at it some years ago, but it never quite grew into the relationship that a few of the writers and editors wanted to see it become. We even have a never-before-seen Salvador Larocca cover of Storm and Cable kissing that never made its way to being printed! Trevor -- The X-Corps haven't been seen in a while. What's going on with these groups since Xavier isn't around to run them? Will we be seeing these satellite groups in the near future? Marts, Michael -- Expect BIG developments regarding X-Corps directly following House of M.
Trevor -- Which X-Man do you think you relate to the most? Also which X-Man (past or present) do you think should have never become an X-Man? Marts, Michael -- Which X-Man do I relate to the most--? Cyclops, I suppose. Can’t really put my finger on why, but I think I’ve related to his character for most of my life. Must have been those messy blonde-redhead love triangles I always found myself involved in. Trevor -- With the X-Men's ability to attract hot writers and artists are there any behind the scenes discussions going on with those that may be writing/drawing future X-Titles? Marts, Michael -- Funny you should ask. Just over the weekend, Alan Davis confirmed his departure from UNCANNY X-MEN as of #463. We are very sorry to see Alan go—the past year and a half with him has been one of the best UNCANNY runs ever, in my opinion. Luckily, he’s not moving far away…he’ll be working on a new project just down the hall—details to come soon. And—we’re very happy to announce that we’ve already signed a full-time replacement penciler for UNCANNY—expect an announcement at the X-Men panel at Wizardworld Philadelphia, June 3rd-5th! Next week—X-Men Assistant Editor Sean Ryan will guest host this column!